During a visit to a 100+ year old fish hatchery in Nova Scotia we meet Bob and explore what it takes to try and maintain the salmon and trout populations in popular fishing destination. Built in 1902, the Margaree Fish Hatchery is the oldest operating hatchery in Nova Scotia and the second of all of the maritimes. Located at the north end of Margaree Valley the hatchery can be reached within thirty minutes of the famous cliff lined shores of Cabot Trail and, with other local organizations like the Margaree Salmon Association, plays a vital role in the health of the Margaree River and its salmon and trout population. Since its creation, the hatchery has had an interesting history of ownership. Originally built and run by the federal government, the hatchery came close to being shut down in 1996 before the volunteers of the Aquatic Development Association of Margaree agreed to maintain it until new ownership could be found. In 2008 the Inland Fisheries Division of the NS Department of Fisheries and Aquaculture took over the operation and it is now run by three full time individuals and a student. One of these full-time, dedicated employees is Bob. Bob, the current acting supervisor, lives within walking distance and has worked at the hatchery for over 13 years. When touring the hatchery and speaking with him it’s clear that he takes pride in the work and has a sincere, passionate interest and concern for the health of the rivers that the hatchery supports. After only a small glimpse into his life at the hatchery, it’s clear that Bob is well liked in the area as he is seemingly on a first name basis with all the local fisherman and, when he stops to chat or work with the fish, the nearby fisherman can’t seem to help but gravitate towards him. 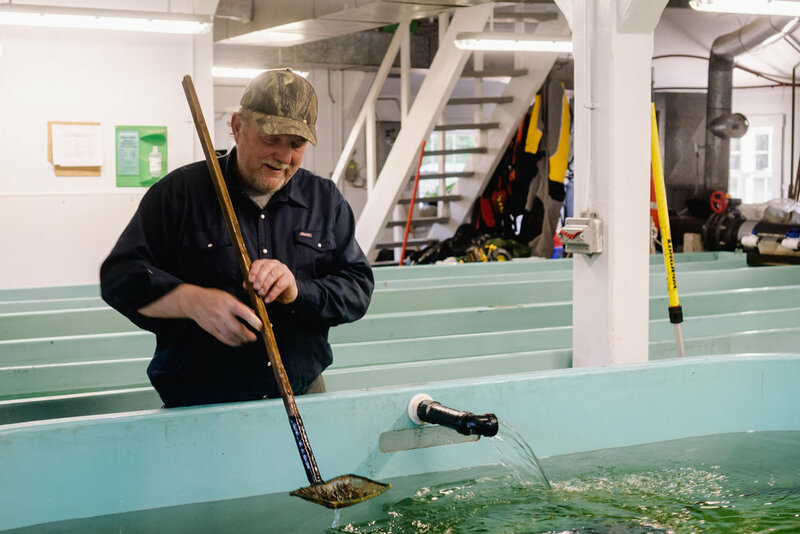 Quickly into a visit to the hatchery, Bob is quick to explain the logistics of how the it operates, “Right now we primarily focus on Margaree River but also spawn for a few other waters in Cape Breton including Mabou, Baddeck, and Middle River. We collect fish from each area and breed them but ensure they are all kept separate and released back into their respected rivers.” Today the hatchery releases approximately 300,000 salmon and 100,000 trout annually. Hearing these numbers it’s easy to assume the rivers are sufficiently stocked with fish, but when asked, it’s surprising to hear that maintaining these populations can still be an uphill battle. Although it’s difficult to pinpoint the reasons of the decline in numbers it's likely a combination of many factors; changes in the climate have caused more frequent high water events causing the rivers to be scoured of eggs, the water is warming, the oceans are being over-fished, and various other combinations have resulted in the ecosystem to become out-of-sync. At this point, one could almost suggest just opening another hatchery but, although the benefits of hatcheries are obvious (especially in combatting the effects of sport fishing) it’s still important to consider the ratio of ‘wild’ fish to hatchery or ‘pen’ fish and the importance of maintaining the wild genes within the fish population. With this in mind, the hatchery never breeds fish that were born from the hatchery (each hatchery fish is tagged by hand), the hatchery constantly keeps a disease free habitat, and the numbers are monitored to insure the majority of the population are wild. During the collection of broodstock fish (fish caught for breeding) over the last 12 years only 11-24% of the fish were hatchery fish, showing that the rivers have a good majority of wild fish. Throughout the Margaree River and surrounding areas there are plenty of regulations and attempts to maintain the fish populations, and these attempts are important to maintain and enforce, but one has to wonder if the regulations are being distributed evenly. For example, sports fisherman are only allowed to fly fish, with barbless hooks, and only within the main stem of the river. In addition, the hatchery has been been successful in maintaining the numbers resulting from these practices. However, in looking further out into the ocean, industrial fisherman are still clearing large populations of wild fish that could also make their way into these sensitive rivers. While there are a lot of valid debates around the benefits and the concerns of maintaining fish populations with hatcheries, one can’t help but feel that it pales in comparison to the bigger picture; why wild populations are declining in the first place. Perhaps, regulations should also be considered in the larger scheme of things by bringing attention to the industries truly threatening the fish population.